I'm at home, nursing my cold, and feeling quite discouraged as finding our lost baggage is a seemingly low priority for Delta airlines. This is also putting a damper on my creative spirit as my favourite pliers for designing jewelry are in those bags, as is the cable to download pictures from my camera! But as I was cleaning out the fridge, a note of inspiration struck me. I was rinsing out all the glass containers emptied of jams, spreads and preserved vegetables and admiring the beautiful shapes of the containers, when I realized the potential of these glass vessels. I may not be able to design jewelry but I can still create! 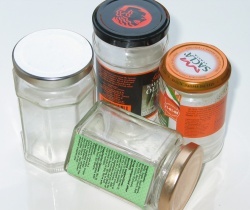 I am going to remove the labels, clean the containers, and decorate them with etched designs and wire wrapped beads. The finished product can be used for various things - candle holders, planters, vases, and lanterns are just some of my ideas! Stay tuned for the finished result and a Do-It-Yourself guide to recycling your own glass containers into home decor items! Rob! What an amazing video and great idea for recycling glass jars into a chandelier. I am definitely inspired to make one of my own.